That the "new evangelization" is at the forefront of Pope Benedict XVI’s thoughts, could hardly be questioned. The Bavarian pope, who as a cardinal had concealed his conviction that it was necessary to simplify and streamline the Roman Curia, has instead created, two years ago, a new Vatican department in charge of promoting and coordinating the new evangelization of Countries where in recent decades secularism has been the strongest. The Synod of Bishops to be held next autumn in the Vatican will also be dedicated to this theme. Lastly, Pope Ratzinger will discuss "new evangelization" at the annual meeting of his former students, the so-called Schülerkreis, which will meet at Castel Gandolfo from the August 26 to 28. In particular, as explained by the group coordinator, Salvatorian Father Stephan Otto Horn, in the '70s Assistant to Professor Ratzinger in Regensburg, reflections will be made on the role of theology in the new evangelization. In order to communicate a modern form of the Gospel to the contemporary world there is indeed a need for high-profile public events with mass participation, and charismatic “leaders”, but also the cultural work of a "creative minority" and especially by theologians. For Horn, the Pope "has warned against attempts to link the efforts of the new evangelization with the ability to lead the masses to the faith over a short time". 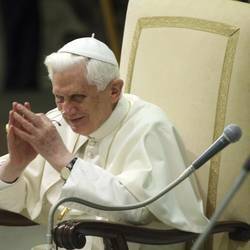 "Of course - Horn said in an essay on the" new evangelization" according to Benedict XVI published in the journal 'Kirche' – he is skeptical of mass movements, because they quickly collapse on themselves”. Hence the need for theologians to contributed to the effort by talking of faith in ways adapted to modernity - a need emphasized in the recent book 'Light of the World', in which the Pope quoted the secular philosopher Jürgen Habermas in this regard. The Pope also warns against '"activism": "The availability - Horn writes, analyzing his thought - to engage in the new evangelization must not slide into activism”. To reflect on these issues, as usual, the circle of former students of Ratzinger will also hear the contributions of two 'outside' experts, in this case two lay people: the theologian Hanna-Barbara Gerl-Falkowitz and the Austrian member of the Community of Emmanuel, Otto Neubauer. The first, an expert on Romano Guardini and the relationship between philosophy and culture, teaches in Dresden, is an old friend of the Pope who knows him from back when he was a professor. The meetings have been held regularly since 1977, the year in which Ratzinger was named Archbishop of Monaco. Since then, the event is repeated every year on a specific topic and has not stopped even with his appointment as Pope in 2005. Since the beginning of his pontificate, the ex-students were confronted themselves on the issues of Islam, evolution and evolutionary theory, the historical Jesus, the mission and dialogue with other religions and cultures, the interpretation of Vatican II . Among Ratzinger's former students who have 'made ​​a career' - and still take part in the meetings - there are the Cardinals Christoph Schönborn, Archbishop of Vienna, and the Auxiliary Bishop of Hamburg, Monsignor Hans-Jochen Jaschke.